Solid footing – a phrase that has frequently been on my mind as of late. I feel that over the past two weeks I have gone from feeling confident about the project’s success to total confusion and doubt and back again. Currently, as I’m writing this I’m feeling positive about my progress. Including my wonderful mentor, Gabriel Betancourt I have been in contact with three researchers who have willingly jumped on the ‘let’s help Anne Katherine’ bandwagon. (Yes, I’m bouncing off the walls with excitement too!) Dr. Khee-Gan Lee of the Max Planck Institut fu ̈r Astronomie in Heidelberg, Germany and I have been discussing possible different data sets available for my use. This seems to have become the name of the game: finding the best data to use. 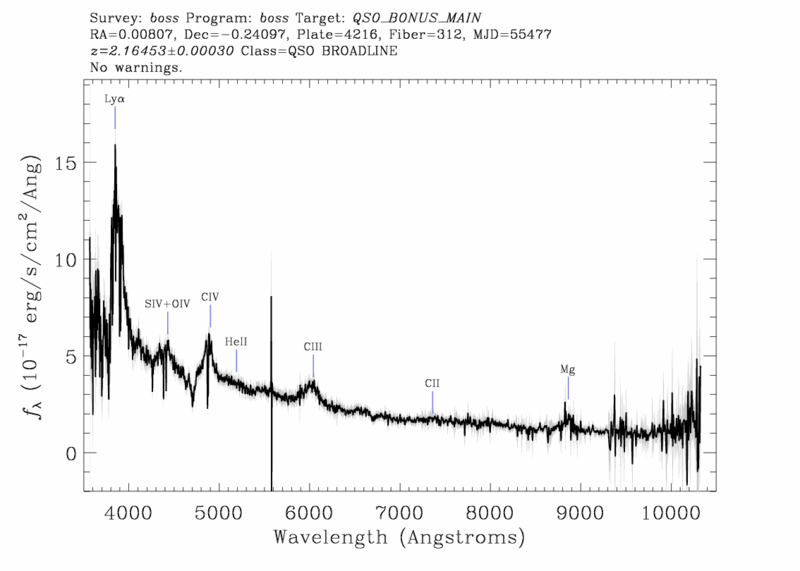 The Sloan Digital Sky Survey or SDSS-III has a public data release that seems promising. Bill Carithers, part of the Lyman Alpha working group at the SDSS-III and I have been conferring about the details of the project. The current direction I’m envisioning for the project is that I would like to take a spectra with many different wavelengths and use just one of these to create a series of pure tones. After completion of this I would repeat the process with one or more other wavelengths and overlaying these to create a detailed composition – much like a violin quartet would play with four different and unique parts that meld together to form an intricate sound. It’s all systems go at operation ‘Music in the Stars’. T-390 days until my self-inflicted deadline arrives. “614 QSO.” sky server. SDSS-III, n.d. Web. 3 Feb. 2014. <http://skyserver.sdss3.org/dr9/en/get/specById.asp?ID=4746962874172634112&gt;. This entry was posted in Science and tagged ly-a, lyman alpha forest, music composition, research, westtown school on February 3, 2014 by annekatherineb.